I read various texts written about the Matsui 's work in magazines and networks including an exhibition catalog, writing this text of a series of. As long as I read, these texts are written about with what Matsui's work deals, and were not written about how it is drawn. The text of everything that discussed Matsui's work claiming is that the feature of the Matsui Fuyuko's work is in the subject matter to take up. I think because such an opinion has the strong impact received from the subject matter of Matsui's work. 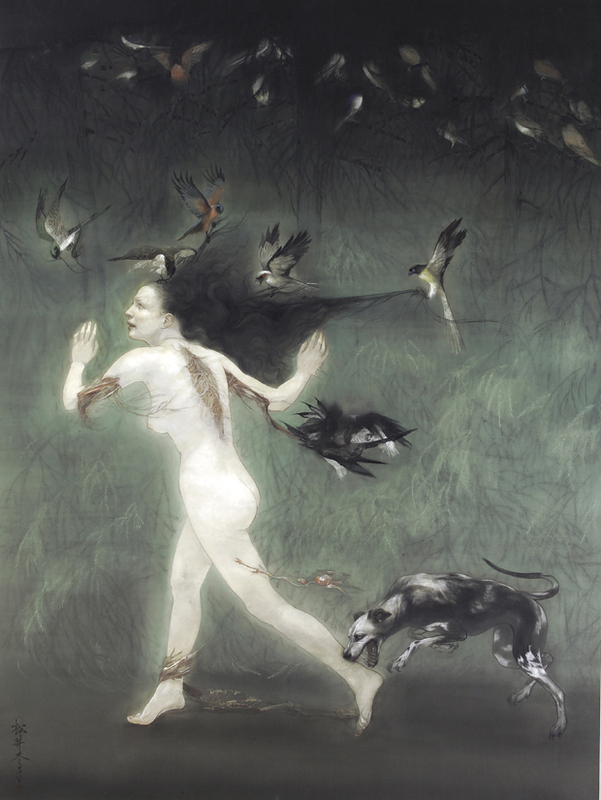 Since many of those who look at her work receive impact from the subject matter of a work strongly, it is difficult even to how her work is drawn to turn cautions. I regard this painter as how to draw having the feature. I think that she chooses a unique subject matter just because the characteristic way of drawing is adopted. However, since I do not actually draw a picture, I cannot distinguish the thing of the technique of pictures well. I consider technique as follows. When Japanese people begin to study Western pictures, they are first taught thoroughly on the basis of a sketch. A Japanese beginner masters the method of the space grasp in Western pictures by practice of a sketch. This is as follows. Grasp space visually as a solid constituted by the field. Perspective. Objective space grasp by the viewpoint of God with an understanding difficult for Japanese people. It is close to it to have called it how depending on which I draw here. The viewpoint of a painter called the Matsui Fuyuko is how to express on a screen death, and not a subject matter but the space of being negative. I was not able to find the text currently discussed from Matsui's work from such a focus. So, I try to discuss Matsui's work for myself. I try to raise the feature of her work off the top of my head. When, as for the first feature, she draws scenery, she is drawing all of backgrounds finely to details. Generally, the painter of a Japanese painting draws a part of background in fragments, and omits the remaining portion boldly. The portion which he omitted serves as space which is not drawn at all. This space makes space and atmosphere peculiar to a Japanese painting. However, Matsui does not install the space common to such a Japanese painting. This is the feature of the first Matsui's work. For example, Fuji's flower in "Becoming Friends with All the Children in the World", a bee, or the tree of the cherry in "Deliberately Caused Insufficiency or Excess". In these examples, she draws an outline clearly as that which each of a flower, a tree, or insects has been independent of completely. She does not make it conspicuous by drawing these delicately by a thin line. In these big works of a scale, she dares to draw the details in a background minutely by a delicate line. And the details drawn when she spent extraordinary time and labor are not conspicuous for the background of a work. I feel insanity for her figure which continues such efforts not to be rewarded obstinately. Her insanity is not caused on the theme of a body or a ghost. So, I think that her look was not macroscopically suitable and is suitable micro. Therefore, when I look at her work, I will insist there surely paying attention to a fine place. Although each of the parts which the Matsui winter child draws is perfectly drawn in the ideal form as the second feature, for those who look at her work, it is too realistic. As a result, there is no feeling of vitality in the person image which she draws. She does the sketch of each part of a human body precisely, and draws it overly realistically. However, those who look at the person image which she drew will not be able to feel for it the feeling of vitality which is in the one whole as a human body, but will look this like a model or a mannequin doll. Also in an animal like an elephant or a dog, he feels it the same. On the other hand, when she draws a small thing like an insect, it is a reality which is likely to escape from pictures and is likely to come out. If she draws the figure which an about 3-year-old naughty child basks in the sunlight which tinkles with the smile of the whole face, and is running about, please imagine what kind of picture she draws. Probably, in the completed pictures, the figure which a child runs will not have a feeling of a lively motion, and the smile of a child's whole face has become what stiffened. Those who look at the picture will not feel a child's pure loveliness, but will feel eeriness. A child's eye and nose of a smiling face, and tooth which she draws are overly realistic respectively. Furthermore, she draws to a fingertip the figure which a child runs minute. However, the drawn child seems to be a body or a doll. I will think that those who look at this will be natural if the child drawn as a body or a ghost is seen. The third feature was derived from the second feature. Although each part of a person which the Matsui winter child draws is ideal, those who look at this do not feel a feeling of a lively motion. The time of her pictures has stopped and is not moving. In music, in order for a player to do the good performance of groove riding, not the performance as a score but a rhythm needs to emphasize an accent and also to shift a somewhat regular rhythm. Since they only mince a regular rhythm analytically if many Japanese players perform the rhythm & blues, their performance does not produce a groove. Since similarly it smells with neither the looseness in a meaning good for the Matsui winter child's work, nor such gap, the time in a picture will freeze. Therefore, those who look at her work briefly at an exhibition feel silence in common. Those who look at her work cannot catch a noise from there. What was drawn there is the same as a body or a ghost, and is unrelated to a motion, and a noise does not carry out it. And the fourth feature is concreteness thoroughly. There is a thing like the model that a bird should be drawn like this in a classic Japanese painting. So, a Japanese-style painter makes the picture of a bird according to a model. He can finish the picture of a bird, without actually seeing a bird. The style nature, sign nature, and improvisatorial nature which are the features of a Japanese painting have appeared here. In a Japanese painting, the picture of a bird follows the style of a model. The rule that birds are such things is the sign that a model expresses a bird. And if the model of a bird becomes regardless of an actual bird gradually, a painter is not bound actually but can draw the picture of a bird. So, the painter can draw a bird improvisatorially, making full use of imaginative power. Stylization followed many of the models of a Japanese painting over many years. When painters drew a bird according to a model, the painter added originality to the model. The model of a bird is separated from the form of an actual bird as a result of the pile of many painters' act. Since people who look at a picture turned out to be a bird at a glance, painters extracted the essence of the form of a bird. As a result, the model of the bird was deformed. This is the reason in which the model of the bird was widely different from the reality of the bird. Matsui does not follow the model of such a Japanese painting. She sketches a thoroughly actual bird. The sketch which she drew seems to be Leonardo da Vinci's sketch. Matsui sketched it faithfully like Leonardo da Vinci's sketch, seeing the outside of an actual bird to a precision. 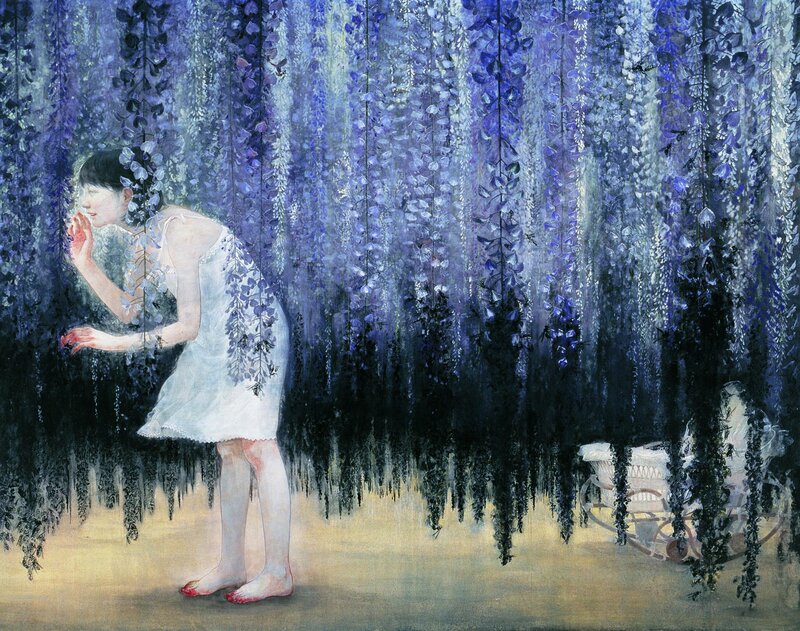 Since Matsui has the intention to strong reality, she cannot follow the model of a style Japanese painting. That is, she does not like improvisatorial deformation. Furthermore, she does not have the intention which creates a new form. She demonstrates creativity in a work to arrange the sketched part. Then, I think. Her pictures have neither a feeling of vitality nor a feeling of a lively motion. She does not create a new form. However, she constitutes visionary pictures combining a realistic part. 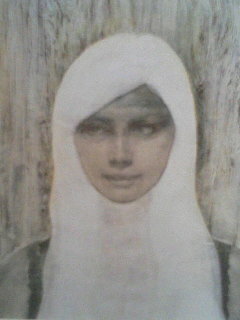 Her pictures built in this way are dealt inevitable with a body or a ghost. As the fifth feature, Matsui makes color of the colorless system the keynote in own pictures. The color which she uses gives bluntness strong rather than the colorless impression of a white system is strong and calling it vividness. It is a color of a body. And finally the sixth feature is considered. The Matsui Fuyuko has appeared in media frequently comparatively. In that case, she appears in media in a Japanese-clothes figure or the dressed-up figure taking advantage of being a beauty. These days, she is becoming the photographer's model. She dressed herself clearly and has appeared in media. When the Matsui winter child acts by media, I think it required for a one woman to pretend to be a painter called the Matsui Fuyuko. 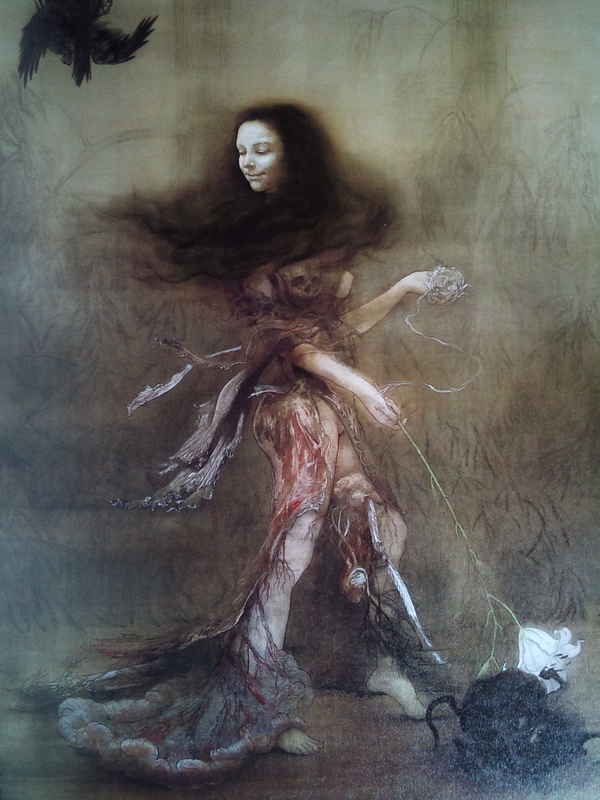 Matsui has given the ghastly design of putting internal organs, or getting damaged and shedding blood in many own works. I think that these designs are related to the posture in which self pretends to be a painter. In her pictures, even if the drawn person puts internal organs and he will get injured, the form of the human body has not collapsed. She respected the form of the human body to the last, and has given the design like clothes on it based on it. It seems to be makeup. So, I do not think that her pictures are expressing consciousness and feeling specially. While she pursues the realistic form in pictures, she is separated from a realistic expression. Then, she gave presence to the object therefore drawn in pictures for giving a fashion to depiction. I think that those who look at her pictures had an illusion, consciousness and a feeling thing, in the fashion which she gave. This is not the interiority of which it is reminded from the word of investigating consciousness and feeling thoroughly. Rather, this is close to the concept of the semiotics of an external thing and signe. I have not done criticism that it is only to trace the surface without digging up the inside of those whom Matsui's pictures look at. Such tend to be familiar with a writer than the talk for which I do not understand well the substance of digging up an inside etc.